Get on board the green machine! 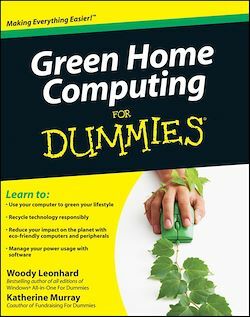 Green home computing means making the right technology choice for the environment, whether it be a Windows-based or Mac-based computer and all the peripherals. In addition, it means learning how to properly and safely dispose of those items and how to use your computer to create a greener life at home and at work. Computer expert Woody Leonhard and green living guru Katherine Murray introduce you to the many green products that exist in the world of technology, including eco-friendly desktops, laptops, and servers; energy-efficient peripherals; and the numerous Web sites that offer advice on how to go green in nearly every aspect of your life. With this invaluable insight, you'll discover that it actually is easy being green!